This is where we really start to learn how to use our foil - starting with setting it up ready for your first sessions. We’ll look at how to carry a foil and board and what you’ll do on the beach before you head out. Then we’ll head into the water, learn more about how a foil reacts to the water and thus how best walk with it and then the different ways of body dragging. Its surprising how awkward just picking up and moving a foil can be compared to a simple twintip or surfboard. The added weight, size and potentially sharp pointy bits can make this first stage of getting out on the water more difficult that you may first imagine. And then once in the water, just moving it around, when you have a device under the water that just wants to head in only one direction - it can be frustrating. 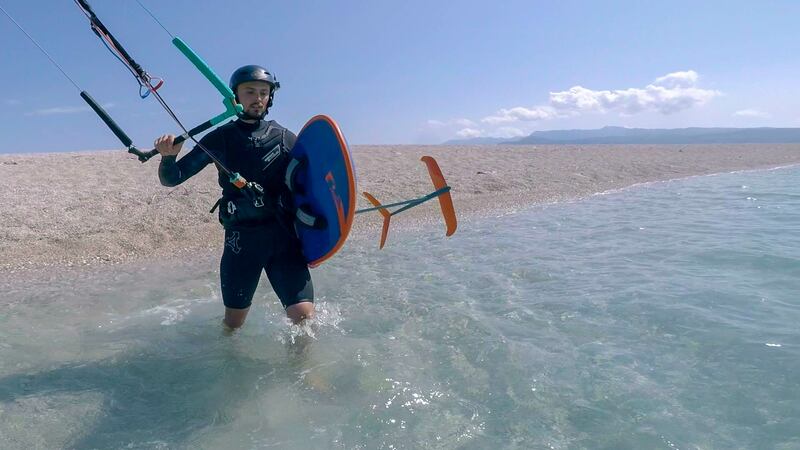 If you haven’t already please ensure you’ve watched the Kite Hydrofoil - Equipment & Terminology video as this will give you a basic overview of all the different types of equipment and fundamentals of how they work. We’ll split this video into three chapter with the aim of getting you out comfortable in control ready to waterstart and get up on the board, which we’ll covered in the next video. We’ll start with how to set the foil up ready for your session. Then look at the various ways in which you can carry it safely and position it on the beach. Please confirm that you'd like Progression to email you when the new Getting out on the Water is available to purchase? You currently have an notification setup for the new Getting out on the Water and Progression will send you an email to let you know when it is available to purchase.